I still remember my first visit to Bali. Here was a land made for tourist postcards, with lush landscapes, rice fields, frangipani and azure ocean. There was also lots of colourful patterned batik, the fabric that women and men wore on ceremonial days – of which there were plenty. And a constant stream of offerings that women carried in little woven leaf baskets, called canang (pr. chanaang). These offerings were everywhere, They made busy crossroads – even those replete with the buzz of a hundred scooters – a sacred space. I asked what they symbolized, and learnt that these offerings were one of the ways the Balinese prayed. 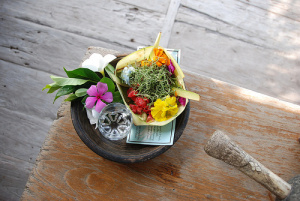 The Balinese love rituals and this was how they remembered their ancestors, spirits and Gods. Diana Charabin, a yoga-studying, passionate, spiritual seeker who happened to be in Bali a year ago, was also beguiled by these beautiful offerings. And inspired! In fact so inspired, that she decided to create a company called Tiny Devotions, in honor of the canangs. What does Tiny Devotions do? Craft the simplest, yet most elegant malas I’ve seen for a while. 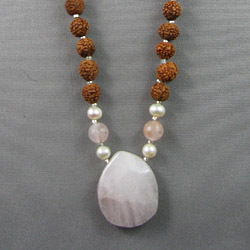 In sanskrit, mala is a garland. 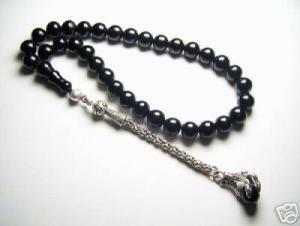 But malas or rosaries; a circle of beads forming a necklace; cut across many cultural tradtions. Some suggest that malas come from the Hindu traditions of India, which would date them to about 5000 years ago. And perhaps that is true. You may recognize their various avatars as rosaries, used in the Catholic and Christian traditions, Worry beads; the Tasbis of Islam; and the Japa Malas of Buddhism, where the beads represent the number of mental conditions or sinful desires that one must overcome to reach enlightenment or nirvana. Modern interpretations also include “charm” bracelets, albeit with fewer beads. While the intricacies of the types of beads and the number of beads in each garland differ from one tradition to another, their purpose is similar. They’re used as decoration as well as a mnemonic to count your prayers. In fact, the word ‘bead’ itself is supposedly derived both from the Sanskrit buddh, which refers to self-realization, and also from the Saxon verb bidden, to pray. Charabin makes her malas in the traditional hindu style, with 108 rudraksha beads and an extra one, usually a stunning semi-precious stone, called a meru to let know when you have reached the end of one cycle of prayers. My meru is turquoise and hangs just below my navel. Rudra in Sanskrit is another name for Lord Shiva, while aksa means eye. An old Hindu legend says that once Shiva opened his eyes after a long and fulfilling Yoga practice, he shed a tear. This single tear from Shiva’s eye sprouted into the Rudraksha tree, that grows today in the Himalayan foothills, South-East Asia, Indonesia, New Guinea, Australia, Guam, and Hawaii. 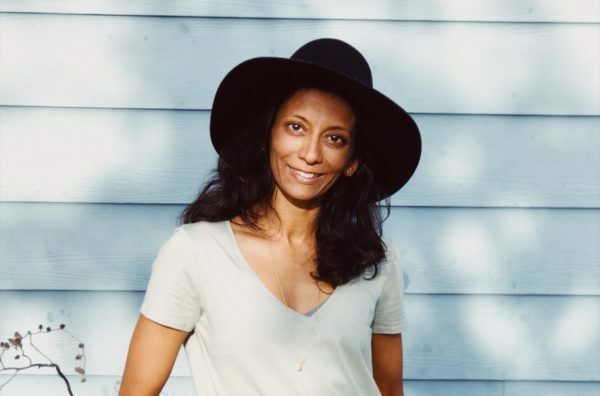 Whether you believe in the spirituality of malas or enjoy them purely for their or sringaar (decorative beauty), there is something both substantive and grounding about wearing a mala. For me, I have a little growing being deep in my belly and the thought of having a smooth yet irregular turquoise stone, (signifying communication, healing and balance) resting at my hara, or energy centre, the spot right where my baby lays, is comforting as I navigate my busy days. It feels like a protective, guiding amulet. I’ve come to think of wearing a mala to be an extension of my physical yoga asana practice, the door through which so many of us enter to go further. There’s so much more available, but only if we want to go there. 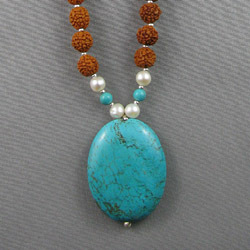 Wearing a mala can be a perfect entry point. The Tiny Devotions malas cost CAD $108 – this includes free shipping across North America. *Tiny Devotions is donating proceeds from their malas to support rehabilitation efforts after the recent Indonesian Tsunamis. This is very beautifully written! Thank you for catching the essence of Tiny Devotions!